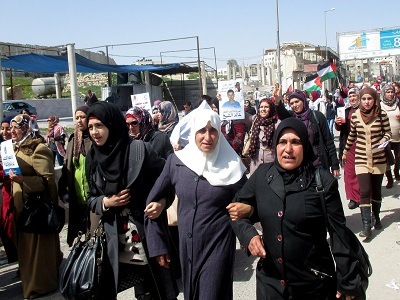 Around a thousand Palestinian women and some men marched on the main road leading from Ramallah to Qalandiya checkpoint. 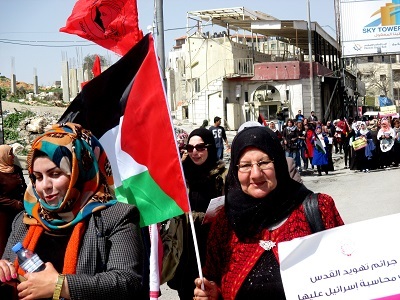 The women waved Palestinian flags and held posters and photos of relatives that had been killed by the IDF. The checkpoint was closed for passage. The gates were locked. For a moment it appeared as though the army would contain the demonstration. But this was just the appearance of it all, perhaps just hope or an illusion. 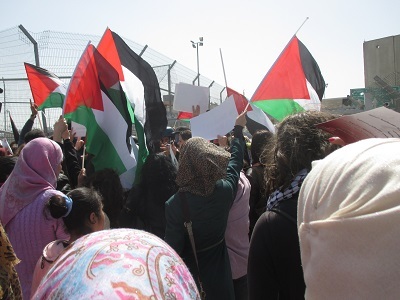 The women arrived at the fences, waving their flags and calling out for their release from the burden of occupation and for human rights, while irritated and impatient soldiers and policemen stood before them. One woman dared to hang a Palestinian flag on the fence. Then, like a genie released from its bottle, like a raging bull in front of a red cloth, the flag was taken down and trampled under the soldiers’ feet. Their commander called: “Fellas, every flag is going to be responded with pepper”. He promised and kept his word. Soldiers came bursting from the checkpoint, shooting without distinction into the large group of women that crowded on the gates. There were soldiers shooting and policemen shooting and even the Malkosh was shooting, a vehicle that on its roof are tens of barrels with gas grenades that are lunched by a remote control by someone sitting in a bullet proof jeep. Women were injured, they fell down tearing, suffocating with burns on their faces from the gas and pepper. They were lifted by their friends and lead with their hands in the noble hands for their sisters to the only ambulance that was present. There wasn’t enough room in the ambulance for all those who were injured, and the ones who couldn’t find a place in the emergency vehicle were driven in privet cars to the hospital in Ramallah. 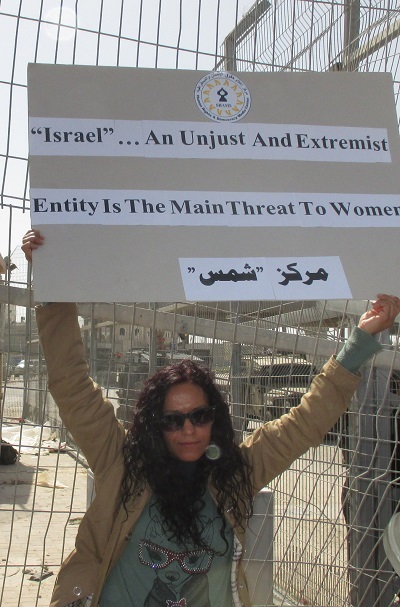 And on the other side of the checkpoint, only tens of meters away from the demonstration of the Palestinian women, but as though taking place on another planet, was a demonstration of Israeli women. The two groups were different as night and day. 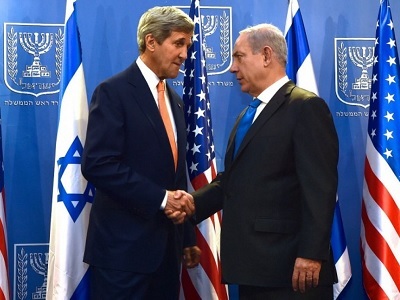 The civilians of the Israeli state got the respect from the IDF that every civilian is entitled to. They weren’t harassed, they weren’t shoved back, they certainly weren’t shot at and perhaps no one even paid attention to their presence (an officer on the other side told me). There, on the Israeli side, unlike the Palestinian side (where I stood), was a friendly gathering with a lot of smugness, cheerfulness, speeches against the occupation, raised posters, drums and songs. Those who claimed that it was only one demonstration taking place on both sides of the checkpoint, must understand that Qalandiya isn’t a coin, and it does not have two sides. There is only one side to Qalandiya and it is dark, degrading and depressing, and that is where it is right to sound a great big cry. Solidarity is to march and to stand side by side with the victim, and not across from him.